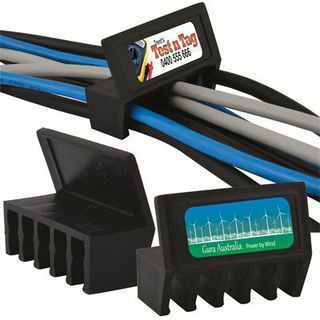 Cable tidy that can be mounted on edge of desk, holds 10 cables. Supplied with 46mmLx19mmH double sided tape. Designed to create a clean and tangle free workspace. Great for the home, office or travel. Great for Sponsorship, Construction, Education, Finance & insurance, Government Administration, Professional Services, Recruitment, Technology, Travel.